If warm sunny beaches and sparkling blue waters are what tickle your fancy, look no further than Miami for your wedding photography session! Start off at the award-winning Essex House Hotel, a classic example of Miami‘s unique Art Deco architecture. The hotel’s gorgeous garden courtyard is a great place for both group and individual photos, and its tropical ambience will add the perfect touch to your wedding photos. Visit Essex House’s comfortable, yet elegant, lounge area, where your wedding photographer can set up a gentlemen’s photo or a girls-only shot along the bar. Finally, kick back and relax on the hotel veranda as your photographer takes some laid-back photos of the bridal party. Afterward, feel free to explore more of the South Beach Art Deco district along Ocean Drive. This famous Miami district features the city’s most iconic Art Deco-style hotels, including The Colony Hotel, Waldorf Towers (dubbed “the jewel of Ocean Drive”), and The Carlyle Hotel, where the 1996 movie “The Birdcage” was filmed. 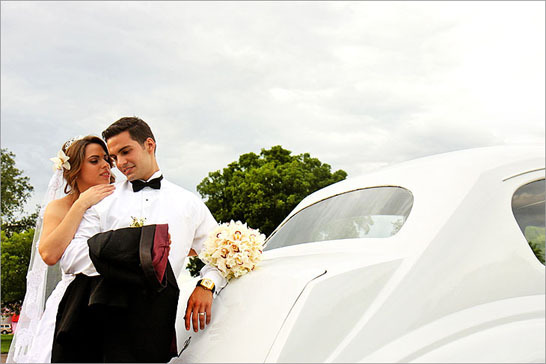 Finally, have your limousine driver take the bridal party to Bayfront Park, one of Miami‘s most-visited urban parks. The park’s expansive verdant lawn is ideal for an outdoor group photo of the briday party, as is its famous amphitheatre. Your wedding photographer can also set up romantic photos of the bride and groom beside the fountain or beneath any on of the towering palm trees. And of course, you can always head to the water’s edge for some picturesque photos with the ocean serving as a backdrop. One of Miami’s most beautiful neighborhoods, Coconut Grove offers many scenic locations for your wedding photography sesssion! Begin your photo shoot at the Plymouth Congregational Church, a treasured historic landmark. Have your wedding photographer take a photo of the happy couple at the beautiful arched entrance. The church itself will make a great backdrop for a photo of the entire bridal party in the courtyard. For another great photo-op, venture into the side yard, where the bride and groom can pose on the lawn or beside the colorful flower beds. And, of course, the church’s gorgeous interior is certain to keep your wedding photographer busy! After you finish at the church, head over to The Kampong, a tropical botanical garden located in the heart of Coconut Grove. Stroll through the 11-acre garden as your wedding photographer captures all the surrounding lush greenery. Pose beside the peaceful ponds or next to any of the exquisite fountains. The numerous benches scattered throughout the garden can serve as great spots for seated photos of the bride and groom. Finally, visit the garden’s Fairchild-Sweeney House, whose stunning Spanish architecture will provide an ideal background for a photo of the entire bridal party. You’ll have an unforgettable time during your wedding photography session in one of Miami’s loveliest neighborhoods! 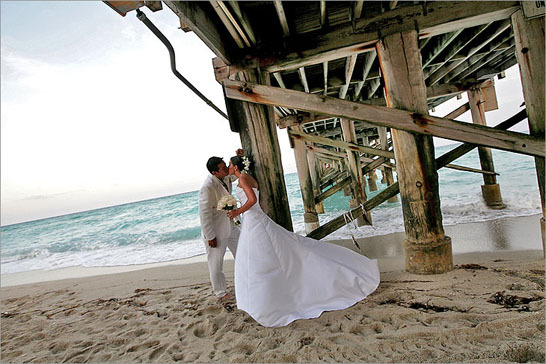 North Miami Beach is one of the most picturesque areas in all of Florida and you’ll have a blast exploring its many sites during your wedding day photo shoot! Your first stop will be the palatial Fairmont Turnberry Isle Resort & Club, whose scenic grounds will have you wishing you could stay forever. Take your time perusing the expansive golf course, while your wedding photographer captures some of the bride and groom’s candid moments. The stone bridge overlooking the pond at the resort’s exterior is also a charming place for a portrait of the couple. For an escape from the heat, walk inside the immaculate front lobby, and take photos beneath the hanging crystal chandeliers, beside the grand piano, or simply seated on the elegant sofas and chairs. You’ll almost surely be convinced that you’re in paradise! Next, take a short limo ride over to the St. Bernard de Clairvaux Episcopal Church, whose medieval Spanish-style architecture will provide a truly romantic backdrop for your wedding. Your wedding photographer can arrange for group photos in the central courtyard, as well as some individual shots. The arched doorway at the monastery’s entrance is also a great spot for a bride-groom photo. Wander through the halls of the church’s and you’ll be amazed by the interior cloisters. Finally, don’t forget to check out the vibrant gardens surrounding this one-of-a-kind structure. We know you’ll have an amazing time during your wedding photography session in Miami - just make sure not to be late for the ceremony, itself!